Universal Studios produced this picture for ABC Television as their September 29th 1973 Movie-of-the-Week. I saw this movie on ABC TV when it first aired in 1973. The plot is a passenger trainload of skiers has lost its air brakes and is hurtling down a mountainside towards certain disaster. Filming took place along the Denver and Rio Grande Western Railroad’s scenic line along the Front Range from Winter Park ski area to Denver, Colorado. Equipment used was the D&RGW Ski train – ex-Northern Pacific 1910-era arch-window coaches pulled by GP30 and GP35 locomotives. 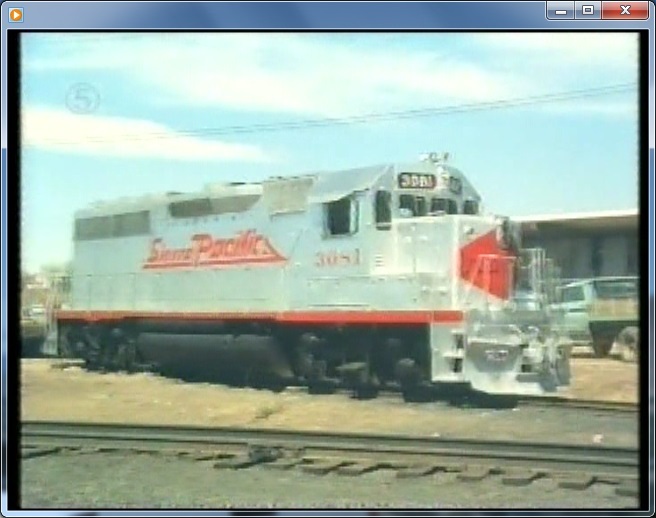 The coaches and engines kept their “Grande Gold” paint schemes, but were re-lettered for the fictitious “Sierra Pacific” Railroad. Engineer Ben Johnson musing about the old days as his train runs away. Why the engineer never used his dynamic brakes (plainly visible on both locomotives) to slow the train is conveniently overlooked. He’s gonna use straight air and that’s it. As the runaway train gathers speed and the engineer can’t get the brakes to apply, he sends his fireman back to the train to apply hand brakes. For some reason, the fireman decides to swing around the side of the cab instead of just opening the door and walking through the cab. Much more dramatic that way. 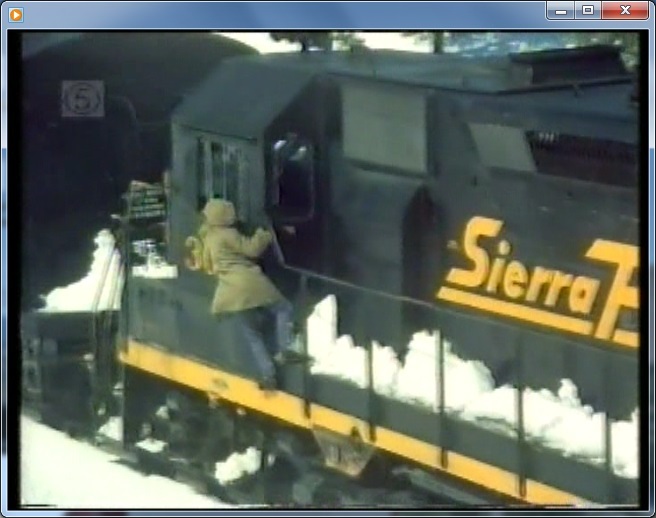 Sierra Pacific’s fireman committing a major safety violation. Back in the coaches, there is quite the assortment of Hollywood’s second tier of actors. Ben Murphy (Alias Smith and Jones) plays the cad who turns out to be the hero in the end. Martin Milner (Pete Malloy from Adam-12) plays, what else, a cop, trying to reconcile with his troubled and somewhat wussy son Mark (played by a young Lee Montgomery). Vera Miles is fun to see as the long-suffering 40-something whose marriage is on the rocks. 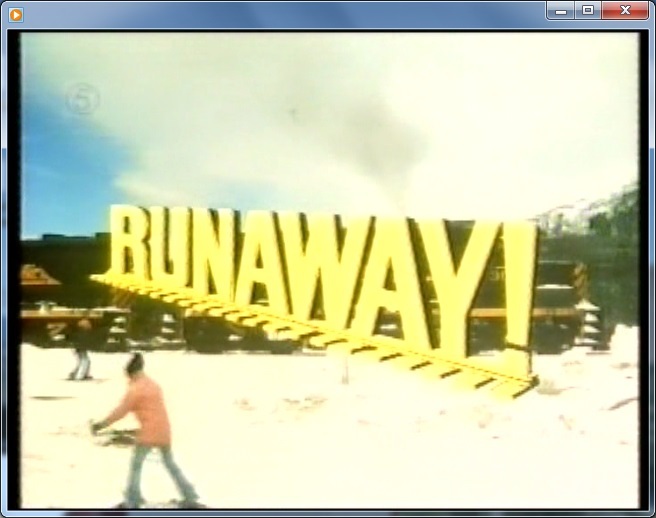 The onboard action is what you would expect with lots of hysterics, tantrums and over-the-top acting. 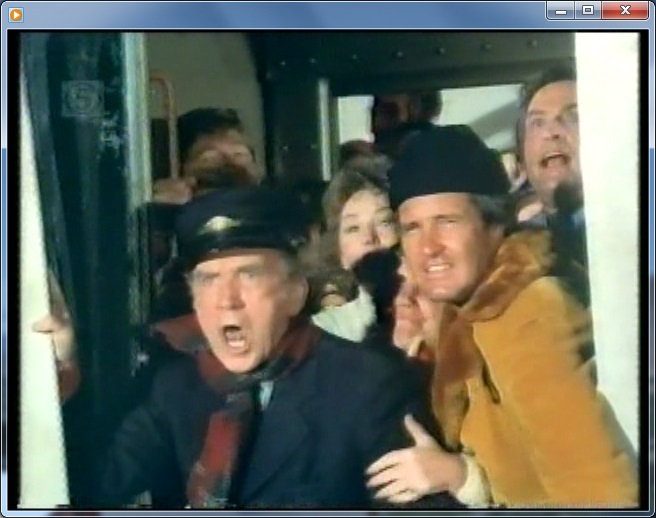 Fortunately, this movie has quite a bit of train action shots to keep things rolling along. After rounding “the curve at Arvada” doing 60 mph (where everyone thought they would derail), the engineer hits upon the idea of having the railroad’s newest engine approach from behind, couple on and brake them to a stop. “C’mon!!! 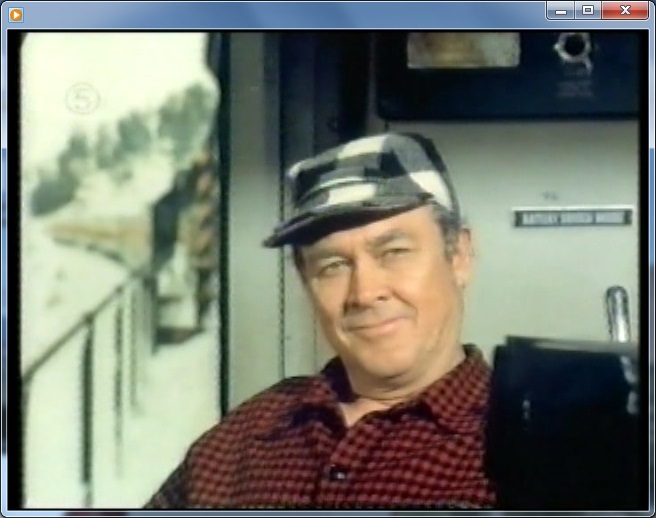 !” The berserk conductor, Ben Murphy, Vera Miles and others beckon the pursuing locomotive to catch up. D&RGW 3081 (a silver-painted GP40) waiting for the runaway train to pass. Sure enough, the silver GP40 is able to couple on and with a great squealing of brake shoes, bring them to a stop about 50 feet from the bumper post at Denver Union Station (Jackson City) just as nice-as-you-please. In conclusion, this movie is worth watching simply for the great exterior train action shots along the 1970’s era D&RGW in the Rockies. This entry was posted in Uncategorized and tagged ABC Television, Ben Johnson, Ben Murphy, Denver and Rio Grande Western Railroad, Disaster Movie, Martin Milner, Universal Pictures, Vera Miles. Bookmark the permalink.